This study proposes an analysis of the main modes of representation of the myth of Prometheus in the Greek and the Roman world, with focus on the different contexts of production and assimilation in respect of vase, sculpture, painting and mosaic iconography. It consists of two parts. The first part aims to inquire about the Greek Prometheus, by going through the essential themes of the myth as recorded by the figurative documentation: the punishment and the liberation; the relationship between Hera and Prometheus; the complex semantic relationship between Titan and the satyrs; the representation, either express or suggested, of the Caucasus, bearing an original schema which will be largely reproduced in the Roman age. The gift of fire is the quid proprium, more or less disclosed and variously expressed, of the Greek iconography of Prometheus, in respect of which certain articulated valences of a funerary, sacred, theatrical, cultural and political nature have been unfolded. The famous theme of punishment and liberation is also recorded in the Roman documentation but here the core is the mud, which is intended as the essential and substantial material of the anthropogony. 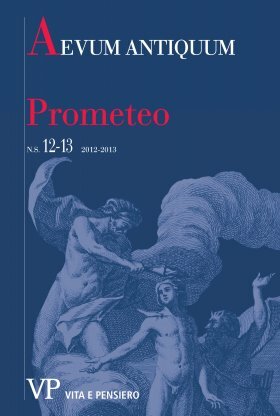 The second part of the study is divided in two sections, with the purpose of investigating, respectively, the modes and the reasons for the re-proposition of the punished and released Prometheus and the processing of the new theme of Prometheus figulus, who is firstly dealt in the ‘italic’ gems and then demanded in the imperial age, particulary by a certain senatorial and intellectual élite.